The Avonews Online website is the official student-created news website for Avonworth High School students. Every effort is made to report news, features, and opinions of interest to the students with an emphasis on timely coverage. The Avonews Online is an open forum for student expression. All content decisions are made through the Journalism 1 and 2 class members as well as any contributing Avonews members. Guest editorials, reviews, and other content are welcome, though they will be edited and posted by Journalism 1 or 2 course students and/or Avonews members. 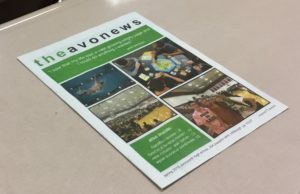 Print editions, as seen above, are distributed quarterly during the school day. Articles on this web site often contain additional content cut from the school paper due to length. Comment policy: Comments and suggestions from students, faculty, administration, and community members are welcome for all our posts, but must be signed with an address where Avonews Online staff can reach you for follow up questions. No anonymous comments will be posted.